When you are in Kagawa Prefecture in Shikoku, you see udon shop in every corner even in the middle of rice paddies field. No kidding, we stopped in the middle of rice paddies field and went into the next door, a noodle restaurant which offer easy & free parking. 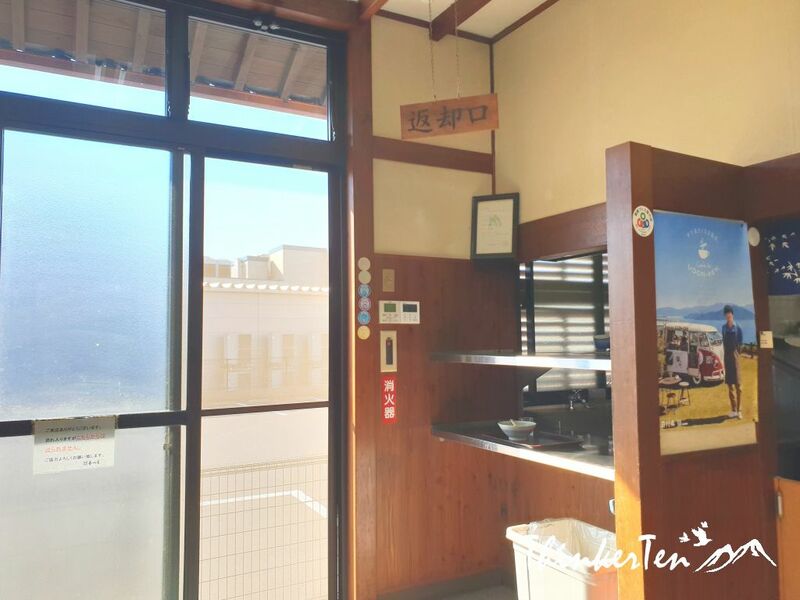 There are about 800 noodle shops in Kagawa Prefecture in Shikoku. If you missed one, there is always another one, few hundred meter away waiting for you. So don’t worry, you see it everywhere. The Udon restaurant we went in is a self-serve so you need to order and pick up anything you like from the counter and pay. 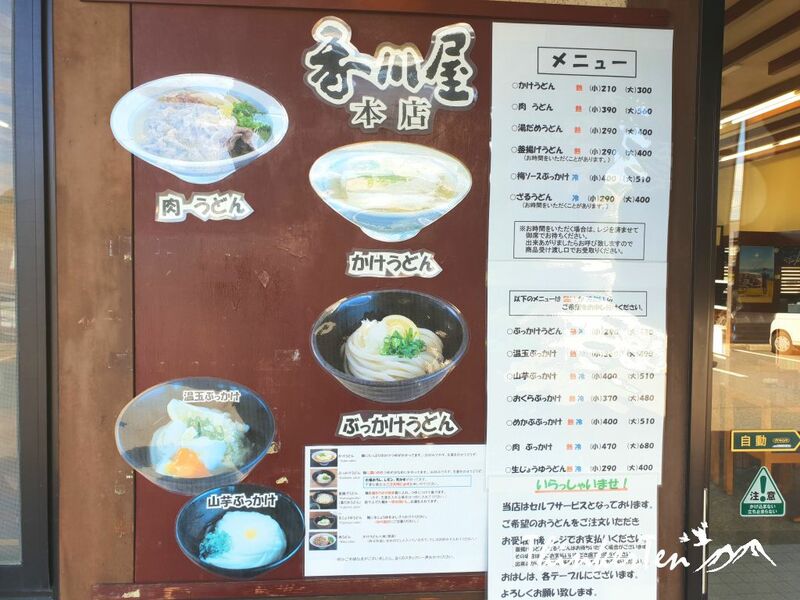 There are many self-serve udon restaurant in Japan, not only limited to Kagawa Prefecture. Some even have their own Franchise chains all around Japan. Add in green onion or sesame seed at the end of the counter. Pay and find a seat. Cold & hot water or tea are usually free but bottle drinks are charged. 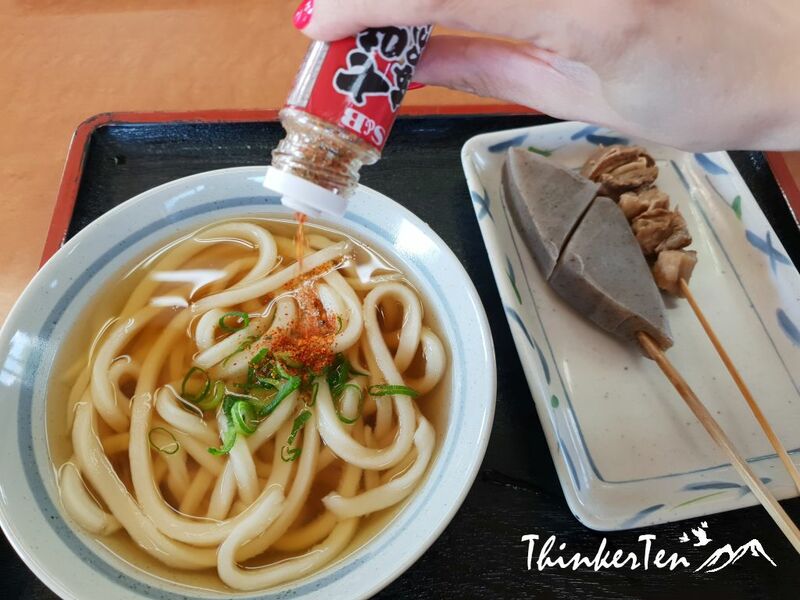 What is so special about the Udon in Kagawa Prefecture? The Udon here is called Sanuki Udon. Sanuki is the old name for Kagawa Prefecture. 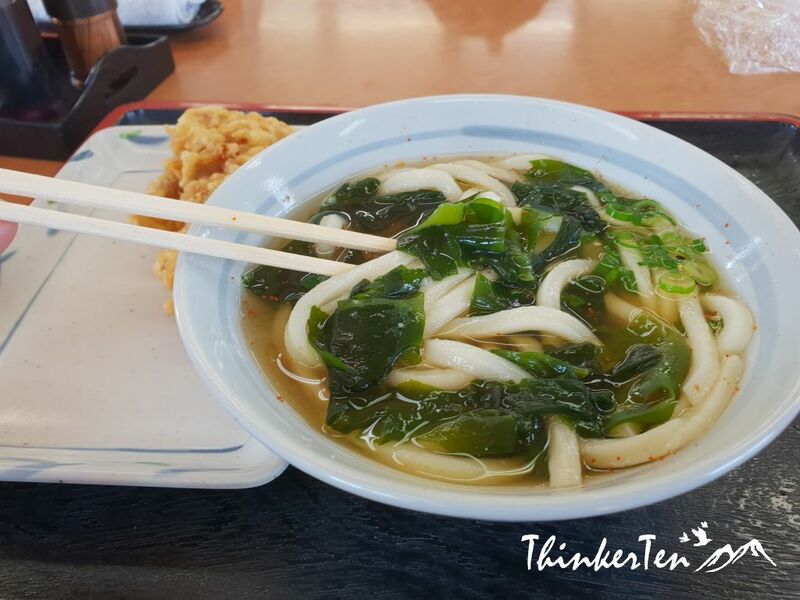 The special characteristic of Sanuki Udon is its square shape and flat edges and also their broth is made from a type of dashi/soup base which different from the rest of other part of Japan. Pour the side dish of seaweed into the hot soup and eat them together with the sanuki udon. 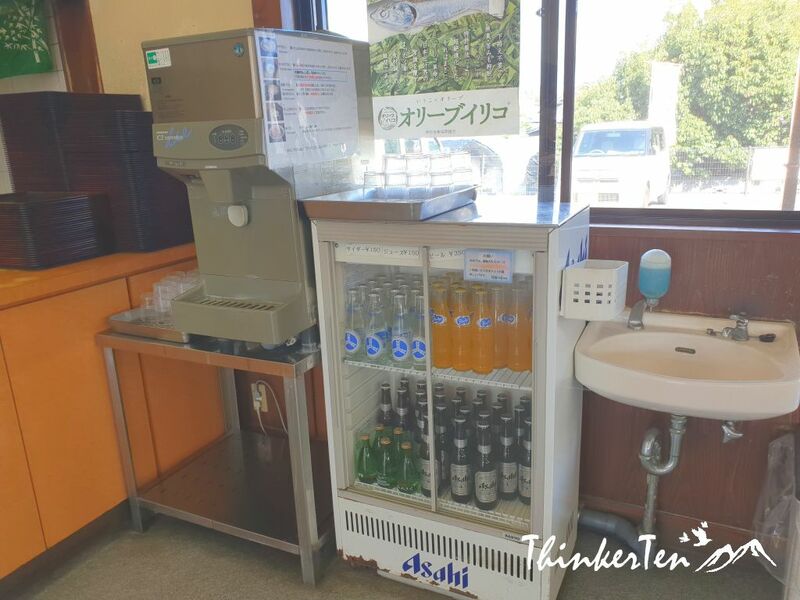 You see shichimi bottles in most of the casual restaurant in Japan such as ramen or udon restaurant. I like to have my udon sprinkle with lot of shichimi powder on top so it give more hot and spicy flavour. Shichimi togarashi 七味唐辛子 is a Japanese spice mixture containing 7 ingredients. 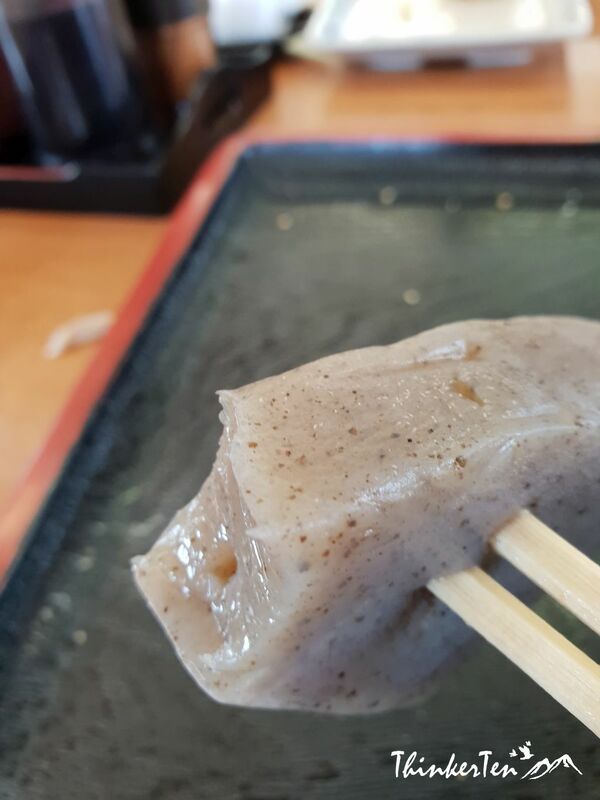 Konnyaku Dish – The weirdest dish I have tried in Japan! I ordered Konnyaku which is an interesting dish in Japan. The texture is rubbery and tasteless. Japanese like to have this dish because they believe Konnyaku is healthy especially for people who wanted to lose weight. The Konnyaku calorie is very low and it keep you full easily. Konnyaku is a made from Glucomannan root – a dietary fibre, hard to digest but very good for stomach as it help to clean away all dirt. Konnyaku can be found in oden soup. Do order one and try it out. Most likely you get shocked, thinking you are eating some tasteless rubber. The first thing you learn when you are in Japan is Japanese will clap their hands and say “Itadakimasu” before having their meal. The meaning is similar to “Let’s eat”. But a deeper meaning is to show your appreciation for the food received. You also have to say “Gochisousamadesu” after you finish your meal. It mean thank you for the meal and I really enjoyed it. It is very important to say it out loud especially if you are eating in your friend’s place as to show appreciation. However, I did raise a question to my Japanese classmate years ago : “Do you still say “Itadakimasu” and “Gochisousamadesu” when you are eating alone at home?” The answer is yes. LOL. Some told me it is a habit that they have already formed and some said they still wanted to tell their “kamisama” god that they appreciate the meal given. “Itadakimasu” has nothing to do with religion by the way. I know is kind of rude but I managed to capture a Japanese guy sincerely saying “Itadakimasu” before his sanuki udon. Do remember to return the tray! In most of the self-serve restaurant, the tray has to be returned at the return corner before leaving. Don’t walk away without returning the tray back and make sure the table is clean and not too dirty. You can use the tissue on the table to wipe away the debris on the table. If you are a budget traveler then udon won’t cost too much damage on your wallet. 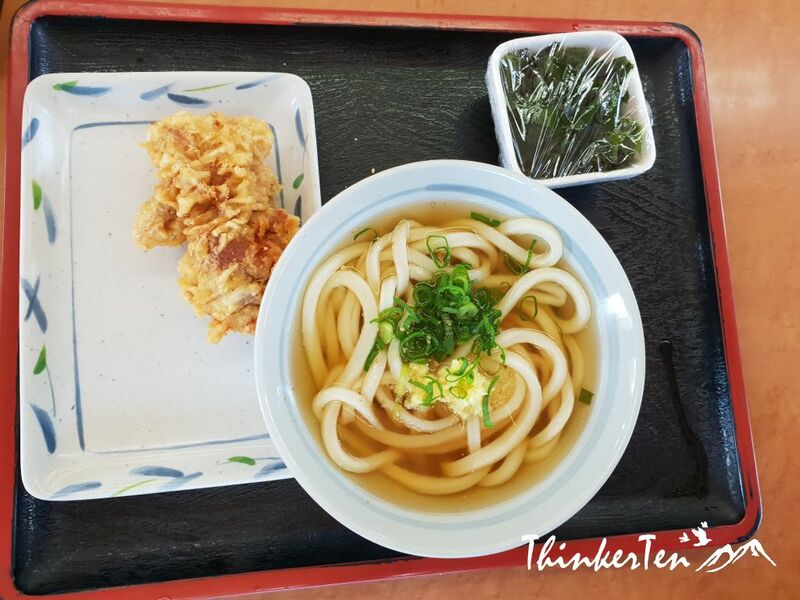 With only JPY 210 (USD 1.80) to JPY 600 (USD 5.30) you get to enjoy one of the best Sanuki Udon in Kagawa Prefecture in Shikoku Island, Japan. Parking is convenient too, right in front of the restaurant and it is free. I don’t know how I could live in an Asian country. I wish I found any of that food appetizing because it looks like a much healthier way to eat. But I just can’t. This looks like it would be some amazing food to enjoy. I have never had anything like this before! I love being able to easily customize a meal. It makes it much easier if you have certain dietary restrictions or preferences. This looks like a great noodle shop! Noodles in Kagawa Prefecture Japan are well known, the texture is slightly different from the usual udon. The noodle type is square shape and flat edges and also their broth is made from a type of dashi/soup base. You are so brave trying all these “interesting” foods. I would love to experience them. What a great article with great information about cultural food. Makes me want to go and try! I could eat Udon noodles every day. I love Japanese udon noodle soup. It has so much flavor. Udon noodles are my favorite too. Compare to ramen noodles, they are less oily. Love how cheap the price is in Kagawa Prefecture. Hmmm. I want a bowl of that noodle soup. Perfect for the very chilly weather here up north. I have not really ever had the pleasure of trying something like what you are showing in your pics but I would most definitely love to. Thank you for sharing and if I ever get there to visit I would most definitely love to try this. Thanks for your comment. There are udon noodles everywhere in Japan but Kagawa Udon is special and famous around the whole Japan. The texture and the shape is different and the soup base also taste different. 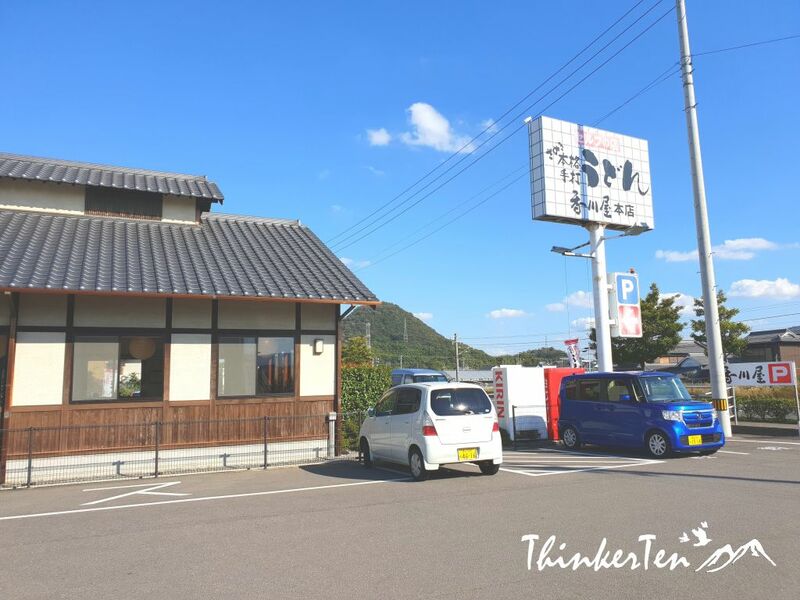 Highly recommended to anyone who travel to Shikoku Japan to try out the “Sanuki Udon” here. You won’t regret it and the best thing is, it cost around USD 200 for a bowl of udon noodles. Yes, that cheap. The side dishes are mostly tempura fried dishes and some oden dishes. The tempura fried dishes are not something too surprise to the foreigners but the may be the some item in the Oden soup can be interesting. Eg the Konyaku dish. 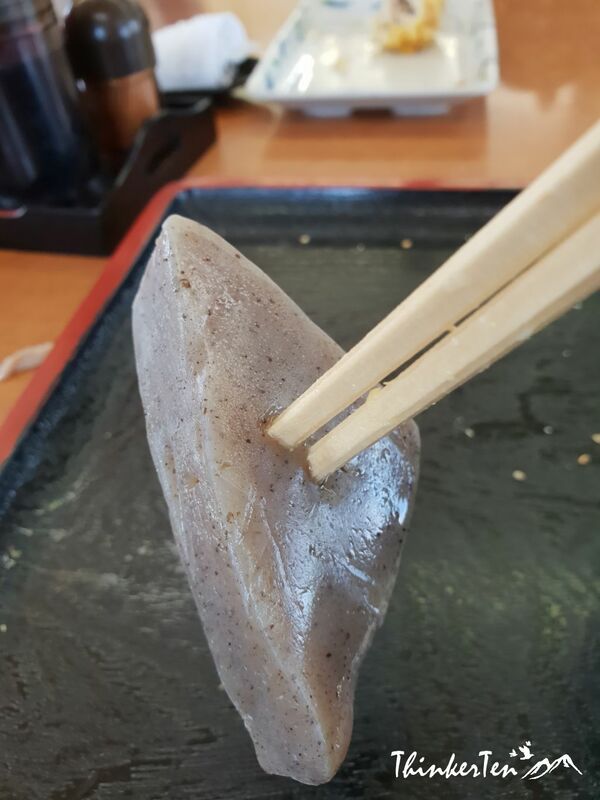 Highly recommeded to anyone who travel to Japan to try this unique rubbery dish. I won’t say is tasty but certainly give your some “shock” factor.